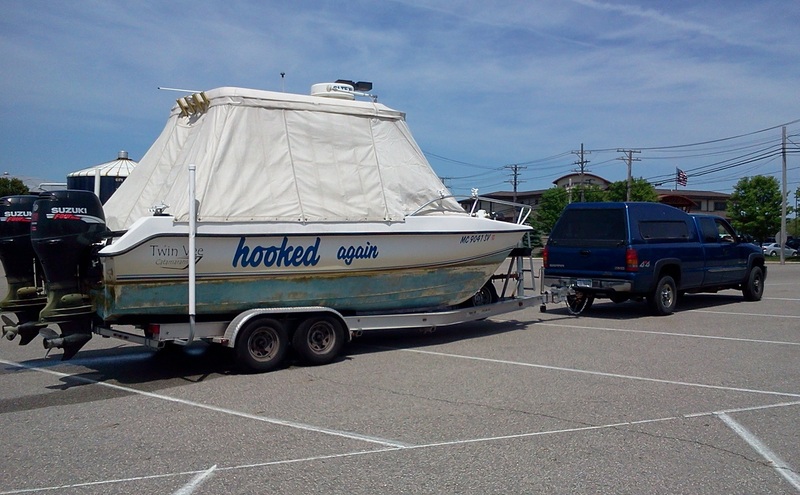 Hooked is a 30′ long almost 11′ wide twin inboard sport fisherman model from BAHA Cruisers. The ship boasts a hardtop over the dinette and helm area plus a cabin and private bathroom. A solid fiberglass hull (no wood or synthetic coring below the water line) adds uncompromised strength to tame “big” water if it is ever needed. 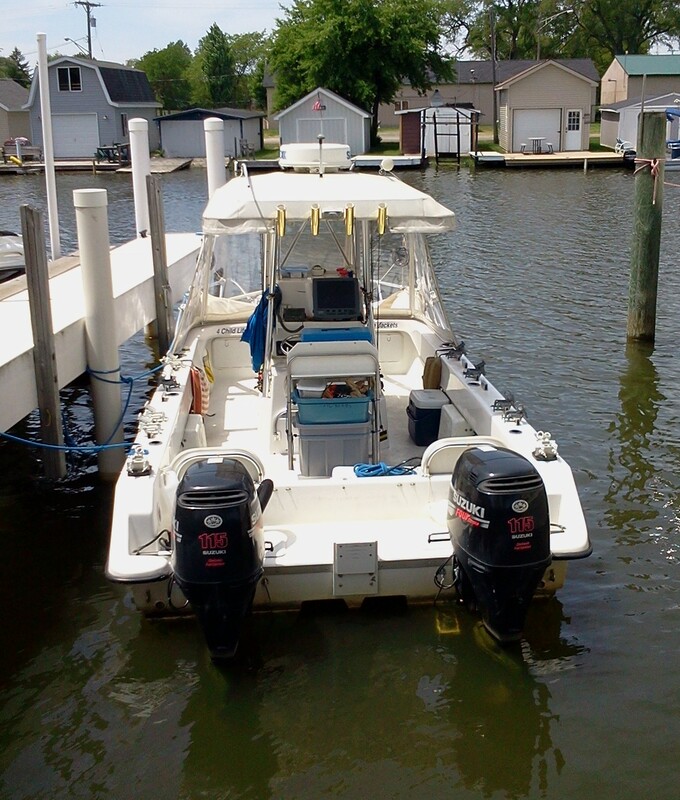 Twin engines and the extensive electronics package which includes radar, depth finders with side scan and down scan capability, along with GPS and plotting capabilities add safety for added security when fishing offshore. Engines are fully below the deck and the deck is the same level all the way forward of the helm and dinette area. This “flush” deck design eliminates engines boxes that you would need to walk around and greatly increases the floor space. Groups of six people will find plenty of room aboard this boat. 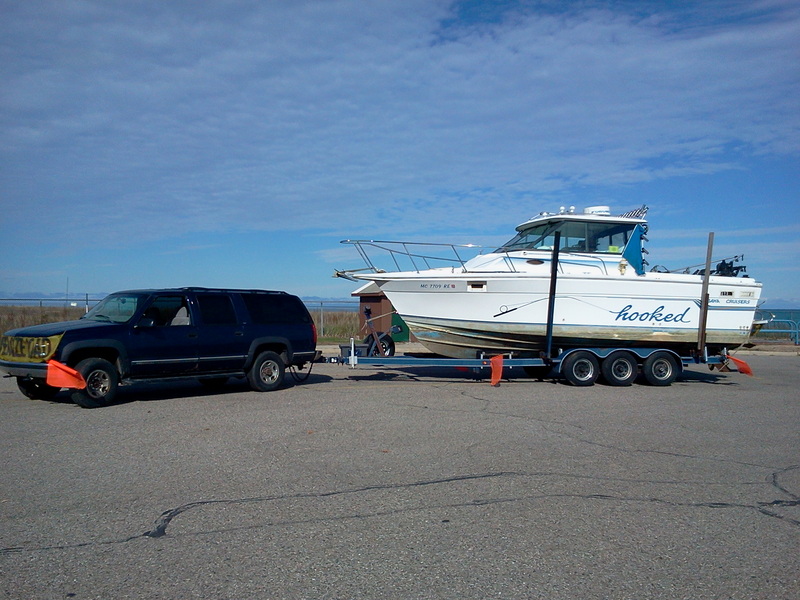 Rigging for fishing includes up to six downriggers and rod holders for 16 or more rods. Quality rods, reels, bait and tackle are included at no additional cost on all of our charters. 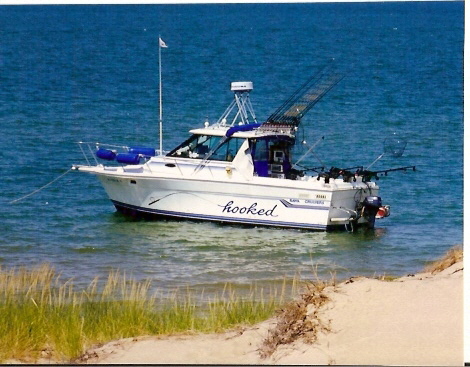 We are confident that you will agree:”hooked” is the ideal boat when fishing for Salmon, Steelhead, Trout and Walleye on big water. 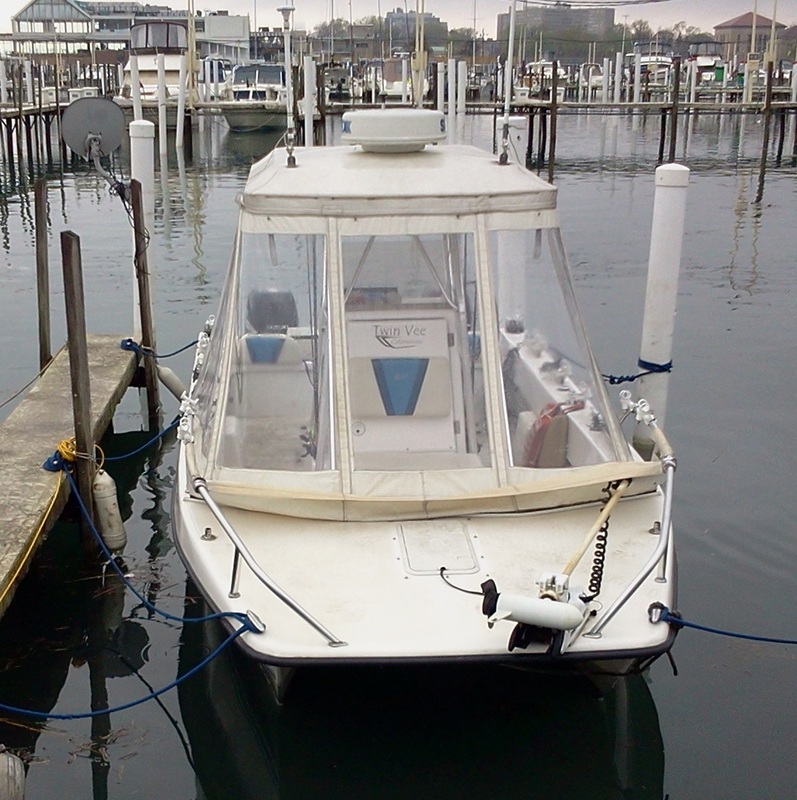 Hooked Again is a 22′ Center console catamaran from Twin Vee. This style hull has gained a reputation for amazing comfort on the water and unparalleled stability. This design has two deep vee hulls with a tunnel between them underneath the boat. With the buoyancy moved out to the beam width of the hull the rolling associated with traditional hull shapes is dramatically reduced. Don’t confuse this style hull with a pontoon boat. These are “heavy” fiberglass designs made to run through the type of choppy sea conditions that would leave pontoon boats and aluminum boats bobbing like a cork. Catamaran hulls are used extensively in the ocean for dive boats and passenger ferries, also, for offshore vessels where the ability to cut through unexpected rough water becomes a huge safety advantage. 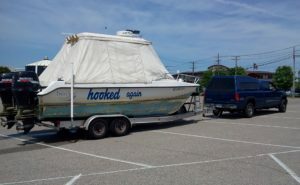 hooked again offers many comforts not found on open boats. A large Bimini top overhead and a Strata Glass enclosure around the bow area protects passengers from sea spray, mist, rain and cold wind. Likewise, the Bimini top offers protection from the sun. We even have bathroom facilities in the center console for everyone’s comfort while on the water. 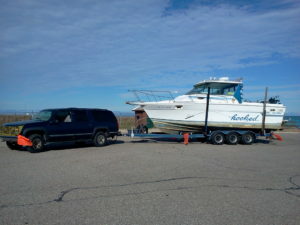 For our use this 22′ catamaran style hull offers more comfort and better boat control than anything else we’ve found. The electronics package includes radar, sonar, chart plotter, GPS, VHF radio, EPIRB, internet capability and more. An electric trolling motor, for precision boat control while fishing, and twin outboards add safety unmatched by most other vessels. The center console layout and long open spaces up and down each side of the boat offer plenty of room for groups of six people to fish at the same time without feeling crowded. Quality rods, reels bait and tackle are included at no additional cost on all of our charters. Among all the boats we could have selected for this type use; hooked again is still our boat of choice when fishing spring walleye, or summer and fall musky, smallmouth bass, perch and walleye. Call for reservations and to check for available dates! We like people and prefer to talk to people. We do not text. Emails are answered as time permits.